There may be a few different ways of preparing مسقطی masghati but this starch based recipe is the only one that I'm familiar with and love! This is a simple, quick, no fuss and yet decadent dessert recipe! This traditional recipe is infused with aromatic rose water, saffron, crushed pistachios, almonds and cardamom; a perfect treat for any occasion or to just enjoy with a fresh brewed cup of afternoon tea. 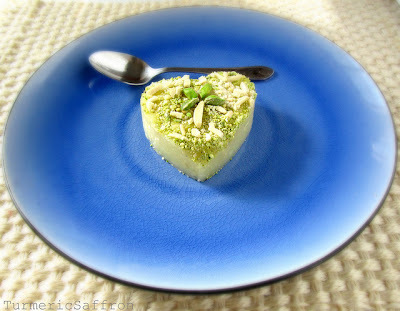 Traditionally, masghati is cut into diamond shapes, garnished with pistachios and almonds and served with tea. You may also serve it in small bowls if you like. I also made an adorable heart shaped masghati for Valentine's Day! This tasty sweet has an intoxicating combination of aromas and flavors and it just melts in your mouth and is quite addictive! It also fills my heart with feelings of nostalgia and eshgh (love), the binding source of the universe! Heat a cup of water on medium to low heat, add sugar, stir until sugar is dissolved. Keep warm. In a small bowl dissolve the corn starch in a cup of cold water till there are no more lumps. In a medium heavy pan add the dissolved starch and 3 cups of water on medium to low heat and cook uncovered for 10-15 minutes, stirring frequently. Then, add the dissolved sugar and stir well. Add butter, almonds, saffron, cardamom and 1/2 cup of pistachios (keep the rest of the pistachios for garnish). Stirring constantly for about 5-7 minutes until with a wooden spoon until the mixture is smooth, well blended and thick. Reduce the heat to low and cook for another 10 minutes. Add the rose water in the last 10 minutes of cooking. Remove from heat and spread into a rectangular flat pan that has been lightly buttered or oiled. Your pan needs to be at least one inch deep. Smooth the surface with a spatula or the back of a spoon and then let it cool for a couple of hours. Cut masghati into diamond shapes, place on a serving platter and garnish with pistachios and almonds. I wish you all a very happy Valentine's Day filled with love and happiness! Haha, aw. 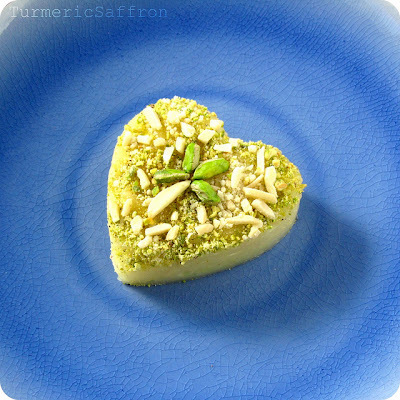 I love the heart-shaped masghati and the عشق in the last shot. I love any combination of nuts, rosewater, and cardamom. I may try this out today, thanks Azita! what a lovely dessert Azita, can't wait to try my own. Wow - how beautiful and what an interesting flavor combination! Fabulous photos too:) Happy Valentine's Day to you & thanks for sharing this recipe! It looks beautyful and must be delicious. I like this kind of sweets. Maybe i'll prepare it one day. Your blog is very interesting. Best regards from Poland! beautiful !! i love these oriental flavours !! yumm, thats a lovely desert. Hope you are having a lovely valentines day. Amazing combination of flavors and impressing dessert. I love the topic of your blog, very interesting, orginal recipes and beautiful photos! 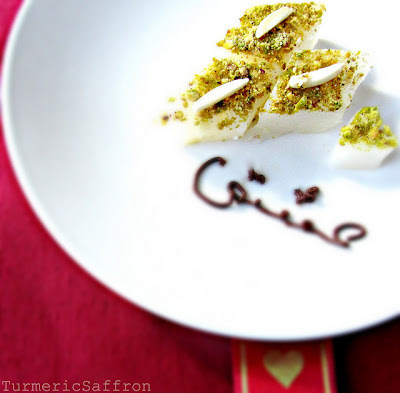 I met the rose water + cardamom + pistachio combination at a restaurant and I cannot leave it alone: I have to try any dessert with it. And before that, I did not even really like rose water.. Thanks for this one! Lovely, sweet and fragrant pudding, I like that! 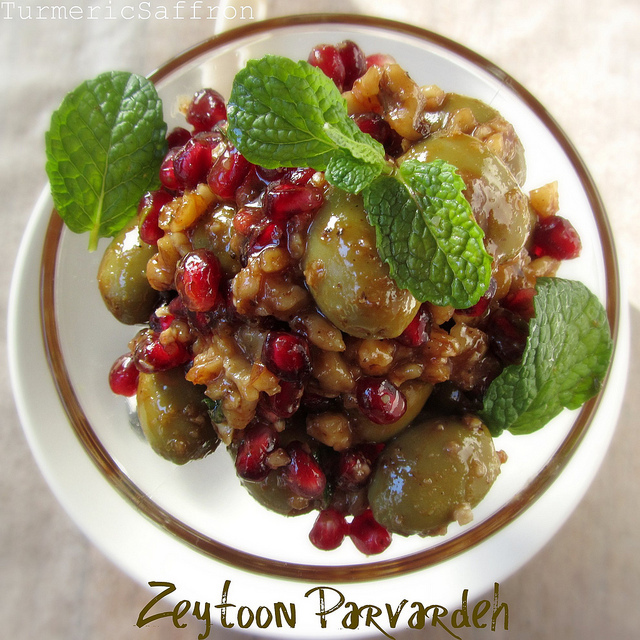 Azita jan, it was a delight to try your version of this recipe. The butter definitely adds a smoother texture- thank you! The way I remember masqati, it was made with wheat starch was a deep yellow colour and gelatinous with slivers of almond tucked in. Love the "eshgh" on the plate- may I ask how you did it? Azarakhsh jan, I'm glad you enjoyed the recipe. I wrote the word "eshgh" on the plate with melted nutella using a mini pastry bag with a small hole in the bottom. These look so beautiful and elegant. Love the flavors of the nuts and cardamom. And that pic of the heart shape with the blue plate is amazing! we have a similar pudding or jelly in Lebanese kitchens based on starch and flavored with roce water with walnuts. Love the heart shape and the photos. @Bria, Thanks so much for visiting. I have made the necessary corrections to this recipe. I hope you'll enjoy making masghati! Hi Azita... what a beautiful blog! I tried this recipe on friday and I found that I had to do the final stirring/cooking for about 40minutes before it was thick enough consistency. I typed in "rose water" in the search engine, and I am very pleased to have found this blog. I used your recipe for masghati last week for a party and they were a hit! I am now itching to try more of your recipes as all of them look fantastic. Btw the photography is amazing too! I am in love with your blog. Thank you for doing this. Leila, thank you so much! Azita, thank you so much for posting this recipe! I'm so happy to discover your entire site. For our Persian-American wedding, an older lady created all the shirini for the tables, and included something very much like this along with nan-e berenji and nan-e nokhodchi. It was the hit of the evening, and five years later, I still have friends asking me what that dessert was! I think I may have finally found it, thank you! Azita jan, thank you for this great recipe! I can't wait to make it! In the ingredients it says 4 to 6 tbsp of butter; how much butter did you use exactly? And also did you use exactly 1.5 cups of sugar in your recipe, or did you just adjust it to how much you liked? And saale no mobarak! The amount of sugar and butter can be adjusted to your liking in this recipe. I used 4 tablespoons of butter and 1.5 cup of sugar. if you like it more sweet then add another 1/4 cup of sugar. Eid-e shoma mobarak! Am I the only person who can't "dissolve the corn starch" I used the store yellow corn starch and stirred it for a while and it just won't dissolve. Is my water not cold enough? am I using the wrong kind of corn starch? am I not understanding the meaning of dissolved? there were still corn starch grains at the bottom of my bowl when I poured it into the pan. 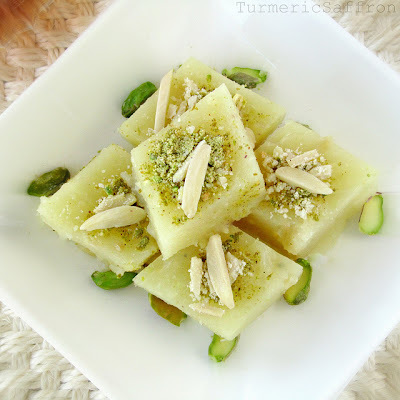 help please because I really want to make this shirini, it looks delicious and my kids can't wait to try it. Kimia jan, the color of the corn starch that I used in this recipe is white and it easily dissolves in cold water when stirred well. You may be using the wrong product. I use organic corn starch sold at my local Whole Food store and it never leaves any residue of starch at the bottom of my bowl. Yasmean, I use the Pyrex 1-cup measuring cup that is 8 ounces. 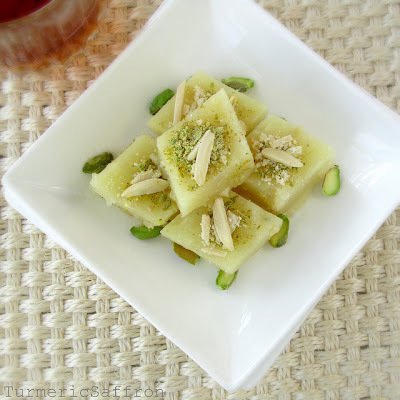 I grew up eating this and was looking for a recipe-I tried this last weekend and it turned out delicious in taste (I did reduce the sugar amount and add whole cardamom pods to the mixture to infuse) but it never set so I could cut it into the traditional diamonds. Did I take it off the stove too quickly? Merci! Shirin jan, making masghati requires a little bit of patience and a lot of stirring. Thanks for the tips---I'll try again, this time with more patience!